Does this sound like your yearly lawn ritual? Every year your lawn probably comes up looking fairly weed free. Then May hits and the dandelions start to pop up. You buy a bag of weed control and put it down with your spreader. 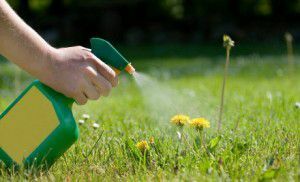 Then the summer hits and the clover, chickweed, ground ivy weeds and African Violet weeds start to over run your lawn. This prompts you to buy some more weed control. If you’re looking to cut down on the number of weeds your lawn gets, seeding every spring and fall is a necessity. Think of your lawn like your body. You can wait until you get an illness and then treat with medication, or you can be proactive and get the proper nutrition and sleep to prevent the illness from ever occurring in the first place. The thicker your lawn is, the less room there is for weeds to grow. That’s why I recommend that you keep up with replacing your bare/dead patches of grass every Spring and Fall. Plus even in areas where you have grass it might not be as full as it could be. Getting in a habit of over-seeding each Spring and Fall is a good practice as well. Seeding doesn’t mean you won’t have to or shouldn’t use weed controls each year, it just means you won’t have as many weeds to kill each year. After a couple years of reseeding and over-seeding along with staying on top of your weeds by killing then promptly you will start to reduce the number of weeds you get each year. As with most things in life, it pays to be proactive. Stop in to Rolliers this Spring and ask one of our sales associates in Lawn and Garden about what seed is right for your lawn.